Schools are not safe from the fallout generated by the Trump administration's immigration enforcement, a UCLA survey finds. WASHINGTON — Teachers and educators across the country say President Donald Trump’s strict stance on immigration has created palpable fear in the classroom, with students missing classes, letting grades slip and exhibiting emotional and behavioral problems amid fear of losing family to deportation. The findings were contained in a report released Wednesday by the Civil Rights Project at the University of California, Los Angeles, which surveyed more than 730 schools in 24 districts in 12 states about the impact of the administration's immigration enforcement measures on teaching and learning. 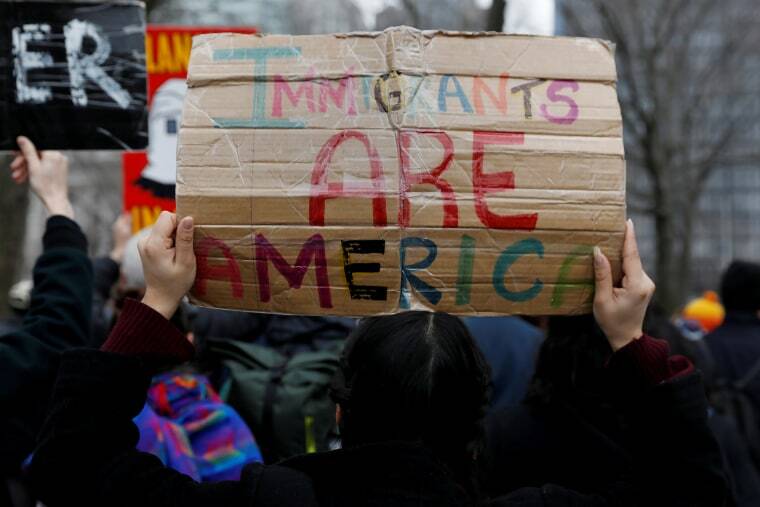 Researchers found that 64 percent of the 5,400 teachers, administrators and other school personnel who responded said they had observed students who were concerned about immigration issues that may affect them, their families or people they know. Another teacher told of checking up on a student who was not eating or talking. The girl’s friends said she had come home from the prom “to find her mom deported and never had the chance to say goodbye or anything,” according to the report. Experts elaborated on the findings of the research in a news conference on Wednesday. The report notes that 88 percent — almost nine in ten — U.S. children with at least one immigrant parent are American citizens. For children under 5, the share goes up to 94 percent, according to research by the Migration Policy Institute. Patricia Gándara, co-director of Civil Rights Project, said researchers started the survey after increasingly hearing from school personnel about problems in schools stemming from the administration's talk and action on immigration. The hardest-hit schools are already struggling with achievement gaps and often are the poorest, according to the survey. Although they weren’t targeted, 82 percent of the respondents are associated with Title 1 schools — those with high numbers or shares of poor children. Schools in the South were most affected. More than one of seven educators in the South and one in eight nationally, reported that students’ learning was significantly affected because of their concern over classmates' being deported. Justin Minkel, who was Arkansas Teacher of the Year in 2007 and teaches first-graders, said all of his students are immigrants, with some documented and some not. About 99 percent of students in his school are poor, he said. “There are a lot of heartbreaking cases,” he said. One of his students this year is 6 and his mother can’t get health care because she is not here legally. Her kidneys are failing. She struggles daily with whether to go back to Mexico to get care and risk being able to return to her child. Students feel the effect of the president's rhetoric on immigrants at a “visceral” level, he said. One young student he found crying soon after Trump’s election told him she and her mom would have to put their things in a bag that night in case they were forced to leave. Lupita Ley Hightower, superintendent at Tolleson Elementary School District in Tolleson, Arizona, said teachers often call her about how to console or counsel students "in crisis" over immigration because she was once undocumented herself. She said her school has a number of programs to help ease fears, including working with parents to provide information about their rights, connecting students seen as anxious or depressed with an individual "caring adult," training teachers and encouraging children to "time travel" to see themselves in reaching their future dreams. She said they refer to their children as kids at hope, rather than kids at risk. Her school district is more experienced in dealing with the effects of immigration crackdowns having experienced former Maricopa County Sheriff Joe Arpaio and SB1070, a law the state passed that widened local officials' immigration enforcement powers. "We really try to create the safest atmosphere in school for parents and the community," Hightower said. Dan Domenech, executive director of AASA, the School Superintendents Association, said the immigration enforcement fallout is being raised at association meetings. Children come to school in tears, worried that their parents will be taken away and that immigration officers are going to come into the school and arrest them, Domenech said. Children are also dealing with backlash from other students who taunt them, he said, such as chanting “build the wall,” which was often heard at Trump’s campaign rallies and speeches. That adds to the litany of issues educators are dealing with, including school shootings and anxiety over loss of health care. Although Congress eventually funded the Children’s Health Insurance Program, or CHIP, potential cuts to Medicare funding have put about $4 billion in funding for special education in jeopardy, Domenech said. Lily Eskelsen García, president of the National Education Association, said at Wednesday's news conference that a second grade teacher from Colorado sought her advice on explaining the behavior of one of her students to his classmates. "She said one of my students comes to school every day - this is a kindergarten student - with what he calls 'all my special things in case they come to get me.' She said 'How do I explain to the other kindergartners what he is afraid of?'" She added later, "For the first time in history, the children of our country are afraid of our president ... it's why they are turning to us, it's why they are turning to their teachers, to someone they can trust," she said. Gándara said the survey found teachers, counselors and administrators are also feeling stress and anxiety because of what their students are facing and the atmosphere they're trying to educate in. Many respondents said they had students with family members who had been deported and the deportations were known to the entire class and community, which reinforced fears about students’ own safety or of their friends. Educators also said one or both parents of some students have been deported or lost a job because of their immigration status, making things even worse for some students. Eighty percent of respondents said they had seen behavioral or emotional problems in students as a result of stepped-up immigration enforcement. The problems were usually described as crying, being unable to speak, being distracted or feeling depressed. A clear majority (57.4 percent) of respondents said they are seeing increased absenteeism, which can affect school funding. Respondents reported students hiding for days while news of raids circulated. By skipping school, some children miss the only meal they may get that day. More than 60 percent of respondents reported some decline in academic performance in students, although they also reported notable resilience in spite of the circumstances. Teachers reported seeing grades plummet among students who had been high achievers or had been working toward college. More than 85 percent of teachers and administrators reported increased of their own anxiety and stress over what their students' are going through. They also reported a sense of helplessness. One elementary school administrator told the researchers he found himself "lying awake at night over whether I should offer to take temporary custody of a child or children in the event that their parents are deported unexpectedly, and that is emotionally exhausting in an entirely new way."